Atlas (Carlão) by Brazilian artist Vik Muniz (b. 1961) forms part of the Vik Muniz: Más acá de la imagen (Closer to the image) exhibition at MAC Lima, Peru (23 January - 13 April 2014). 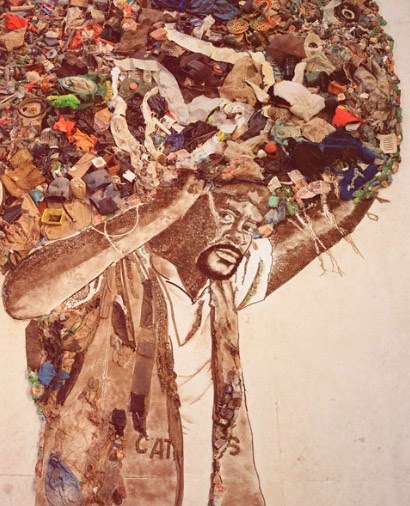 The work is from the Pictures of Garbage series and was created by Muniz in collaboration with the rubbish pickers (catadores) of Jardim Gramacho, an enormous open-air rubbish dump just outside Rio de Janeiro. Transforming the rubbish pickers into classical figures such as Atlas or versions of real paintings injects further depth to the works given that the subjects are represented in the material (rubbish) of their surroundings.